Mystery Boxes are back at Nickel City Con! That’s right Mystery Boxes are back at Nickel City Con and they are better than ever! 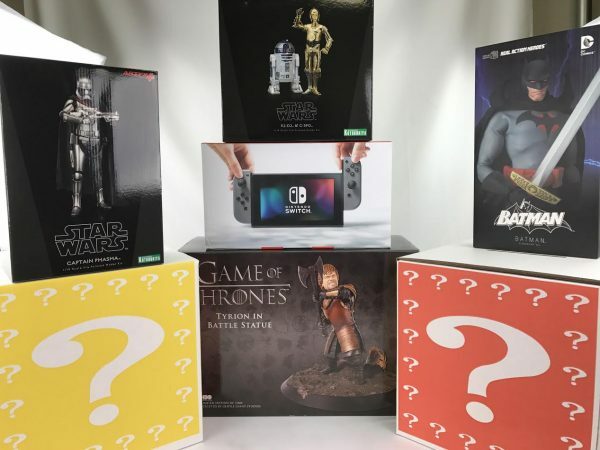 Not only are they filled with items from some of pop culture’s hottest franchises including: Star Wars, DC, Marvel, Dragon Ball Z and more, each box will include a Funko Pop Vinyl, plus several other items totaling a minimum $70.00 retail value! $40.00 gets you an amazing selection of products and of course the chance at some of our great prizes including the grand prize…a Nintendo Switch! Mystery Boxes will be available at booth 713…but hurry – they won’t last long!